Most people I know were appalled to hear this. Just the basic ideology behind the scheme sounds nauseating. I for one thought this was the most humiliating news as a disabled person. The thought of paying someone to marry me!!!!!!!! I can go on expressing my distress about this scheme. While I, along with may other thought it to be ridiculous but alongside there was a thought that disabled people from under privileged economic backgrounds may benefit from this especially because Rs 50,000/- is a large sum of money for them. I have never worked with disabled people from poor background, so was forced to rethink my stand regarding the scheme. 1. Today the disability movement is demanding for a rights based society where a disabled person has equal rights and equal access to exercise those rights. At least, that was my understanding from all the advocacy happening for amending the existing PWD Act, so if that is the case than why is charity so acceptable. 2. 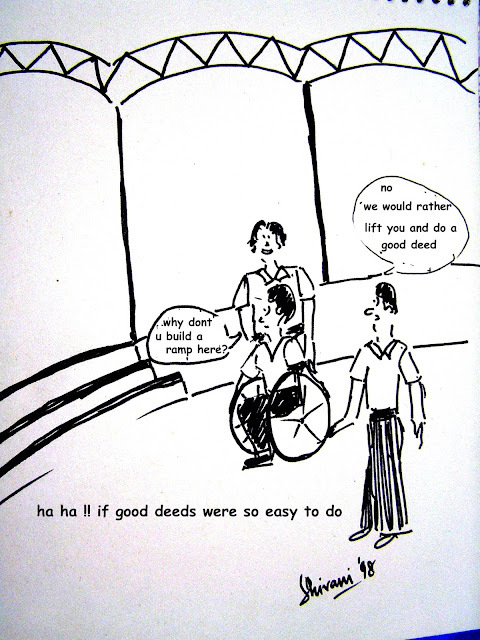 All of us – if I may say, more vocal people with disabilities condemn the thought of charity because it hurts our self esteem as human beings then why does the same charity in the case of marriage seem alright for a disadvantages disabled person. Is he/she not a person first before happening to be disabled like any of us? 3. Probably only 5% of my friends with disabilities are married in spite of their being economically stable mostly because non marriage of disabled people is a social issue so is it fair that the government only encourages or addresses this issue only amongst people below a certain income group? And that to by hanging a carrot of monetary incentive. 4. Does the government have systems to evaluate the scheme especially to ensure it is not being misused and doing more harm than good that it intends to do? 5. I have come to understand that Rs.50,000/- is sometimes more that a poor persons life long savings. So what is clear is that it is a large sum. If so then why just because someone is disabled should they receive such a large sum as a grant to just either save or spend away? Will this he sum be not better utilized in make the disabled person more self sufficient probably by running a small business etc. 6. Similar schemes are already running to encourage marriage with a ST/SC. If that is the route taken to include the ST/SC then why is it so automatically though right to adopt for the disabled, just because both groups have been marginalized or is it because it’s easier to demand alms on that pretext? Aren’t the needs of a disabled person unique and different from a non disabled person even if they happen to belong to ST/SC category? Well I think my contention is not as much as the government giving 50k to disabled people as much as it is about giving it on the pretext of marriage. But with the small reaction I have seem in general about this scheme, I realize the double standards we the disabled people live with. The very same issues and thoughts that seems wrong and unacceptable to us as individuals are acceptable or even good for a disadvantaged person – why just because they will get some free money??? As I said I am confused. I admit I am ignorant about life of under privileged disabled people and I may be entirely wrong in my discussion, but I would really appreciate view points to understand better. I am writing to you in reference to the formation of the newly formed taskforce for the Proposed National Centre for Universal Design & Barrier Free Environments. I was invited to express my views by the Committee set up for drafting the ‘NEW DISABILITY ACT’, as a representative of the civil society. The meeting started very well, with all committee members pledging their commitment to including people with disabilities in the complete process. There were of course discontentment from people, but being the person I am, I appreciated both sides of the argument and had little to add besides about accessibility. Accessibility is my subject so I was happy it was the first to be discussed. The legal consultant appreciated the richness of the document developed by the Sub group, who had unofficially consulted me extensively as an external expert for the draft. I am passionate about accessibility and am acutely aware of my role as the only disabled professional in the subject, and was happy to give the draft document shape and direction, without any vested interest, name or recognition. I was satisfied with our discussions, as I believed that we had included a majority of what we want to say. I somewhere take it as a moral responsibility to ensure that people with disabilities get mainstreamed. The next session was on HRD. A senior government official commented that there should be professional education, namely, post graduate and above, available to disabled people. I was thrilled to hear this. I was reminded of the time, when as a disabled person, I needed to go abroad to do my post graduation in ‘Inclusive Environments,’ – another term for ‘Universal Design’, and I spent lakhs of rupees and am still struggling to pay-off my education loan. This would have been a fantastic opportunity for aspirants like myself. I invested so much because I believed in the discipline and wanted to improve the lives of disabled people in India by bringing in professionalism and quality. Soon after a ‘government notice’ was circulated telling us about the constitution of a ‘Task Force to work out the details of the Proposed National Centre for Universal Design & Barrier Free Environments.’ This came as an absolute surprise to me. I was angry, in fact furious, to see this note, at my exclusion from the task force. My CV had been invited during the process of deciding the members to be on board, but I wasn’t selected. I am no judge for who is on the committee, but would like to know which of the members had credentials that were better suited than mine. To me, the only thing each one of them had in common was an employment in different government departments. It’s ironical that this came during a government committee meeting that was harmonizing the Disability Act with the UNCRPD. I am beginning to believe that on ground, nothing is going to change, even if we drafted the best Act. My confidence in your team is shattered. How am I supposed to believe in a team who proclaim to be working for the cause of the disabled people, but cannot acknowledge their capability, even when backed with professional education? They cannot accept the value that disabled “professional” experts can bring to the table, as they may be far more sensitized to the issues of the disabled people. Till now I have never voiced the rejection that I have constantly felt from the Government in being part of the system. I cannot even count the many instances, but today just seemed like the last straw. What pierces my heart is such callous behaviour from the government. I find a complete apathy to the subject that is still so lacking in our country. I am disillusioned with all promises made. I am tired of giving out for free, the knowledge that I spent so much to gain. I do not see any hope, and wonder what the point of continuing is? It is meaningless to have any provisions or facilities accessible to us. Why should people with disabilities opt for higher studies and raise their aspirations - only to be broken! And if MSJE themselves cannot appreciate us, then who will? I am a person who likes to work as part of the system, and would like to continue the same way, but today I find myself thrown out, and forced to challenge it and dismiss it. Not out of my own free will, but as a reaction to the decisions of your Ministry. Sir, I urge you to create opportunities for fresh thought and professional approach to be included within your team to achieve the high goals that we have set out for ourselves, under your able guidance, in a truly democratic environment.